Having spiraled into self-destruction, Irish finds himself homeless on the streets of London. 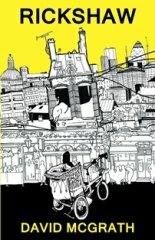 In a last-ditch effort to sort something out, he rents a rickshaw, propelling him into a frantic sub-culture of criminals, misfits and lost souls. David McGrath has won the Bare Fiction Prize, the Peirene Press Story Competition, placed in the Words with Jam Short Story Competition and was highly commended in the Manchester Fiction Prize 2013. Hilarious from start to finish; a type of humour that entirely matches the subject. Loved this book.